Last October’s Sandy destroyed the interior of our woods, taking upwards of 200 trees in her wake, including many special native species that I had planted over the 28 years I have stewarded this Tinicum property. For some time, I couldn’t even face making decisions about what to do. I knew that I wanted all the woody material to remain on the property. Those wind-thrown trees and shrubs represented years of sequestered nutrients taken from the soil. It had to be returned. Part of our property has been deer fenced for ten years. Inside the fence, a young mixed deciduous forest grew, some trees reaching 30 feet or more. Here, I cleared and chipped some downed trees to get to the paths I built. Others trees were cut into sections and piled for critter habitat. The very center, where there were no paths, was left a jumble. The chips were used to rejuvenate the trails that weave in and out of the property. To speed up decomposition, I drilled 400 holes in the log sections. 300 were plugged with three species of saprophytic mushrooms, two of which are edible. The fourth set of 100 was treated with Stump Buster (an inorganic acid). Some logs were left untreated. From a totally wooded, shady property, an open, sunny area emerged. Given an opportunity to reforest with native trees, I planted 10 American chestnuts and 5 American elms in May. I added some oaks, a fantastic tupelo, two redbuds, two fringe trees, and some sumacs -- staghorn, shining, and fragrant. Throughout the sunny area I planted landscape plugs of fairly short- lived wildflowers – magenta gayfeather, yellow Baptisia, purple summer phlox and white daisies. They’ll provide a rainbow and compete with the weeds while we’re waiting for the trees to reach shade producing heights. Outside the fence was a different situation. 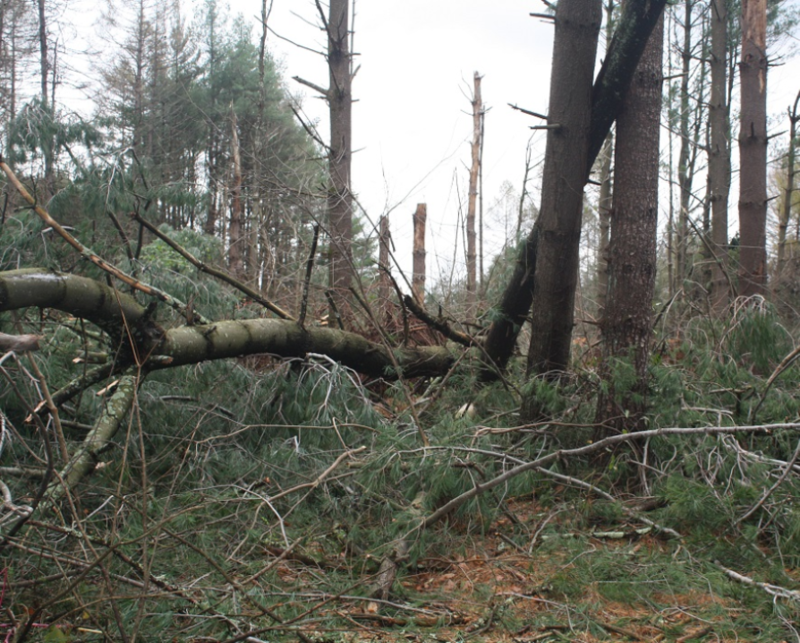 Because it was accessible to deer, no understory had developed, and the destruction was nearly total. The tree crew was cooperative but dubious. They were used to chipping everything possible and hauling away the logs. It wasn’t easy to convince them to remove all the branches, section the logs, and get everything into contact with the ground! We left several dead snags for the birds of prey, and my Cooper’s Hawk has already claimed one of them for his own. Tis messy to be sure, but in twenty years, there will be a young forest on the site, much healthier than the monoculture of pines from before.